The subject line of this blog post was also the subject line of an e-mail my son Mike sent me with the photo above attached. 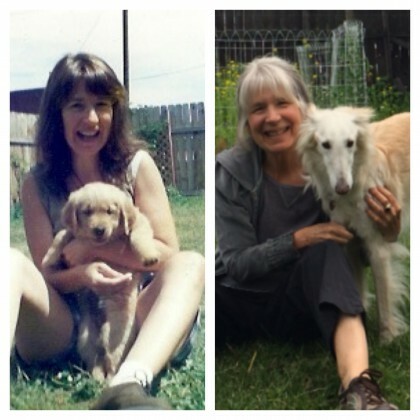 The first half of the photo was taken the summer I bought the blue house, the summer of 1994, the summer we got Tinne, our golden retriever. I was 38 and she as about 10 weeks old. There’s no garden in the background, no pear tree, no raspberry patch. It’s all yet to come. Memory is a subjective force and no two people remember the same things or even the same thing the same way. Mike and I often contend about our memories. He usually tells me he can’t remember much of anything. I usually point out to him the things he does remember, which are often things I’ve forgotten, at least with the clarity he recalls them. Since he is usually not convinced, I sometimes keep those things I notice about his remembrances to myself, and hold them close. After their visit over the last Christmas holiday, I searched in vain for the dust pan. Mike had been his usual wonderful self, resuming his role as chief dishwasher after our many meals, and he would often include the perk of sweeping up the kitchen as he finished late at night. I was just about to chalk up the disappearance of the dust pan to an alien abduction when I realized that at the time he lived at home, the broom and dust pan had been kept near the washer, and somewhere along the line, their usual place had migrated west, over near the water heater. Sure enough, there was the dustpan, back where it had been when he was just sixteen. To me, that meant he was still coming home to the house he remembered from long ago, and it was just second nature enough that he didn’t notice it as a memory. But this last time of emptying out the blue house made a believer of him in how objects and places indeed evoke strong and sensual memories, assailing us when we least expect it. The last object he took out of his old room to bring back to Portland was a skateboard given to him by one of my former students when he was just learning how to ollie. He brought it down to the sidewalk where he learned, and where I watched him from the porch when he was 10, encouraging him along with “Yay!” “Very Good” “Bravo” and the emphatic round of applause. 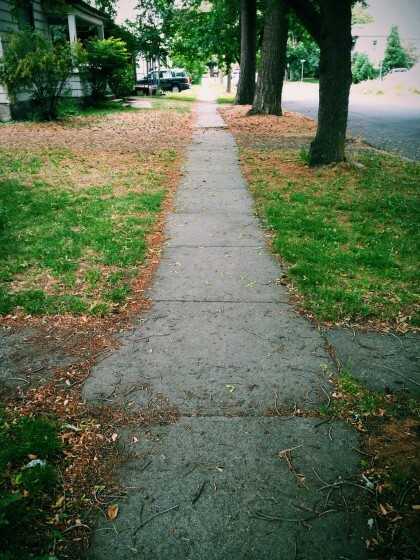 On his return to Portland, he posted this photograph of the old sidewalk on Asbury Street online, with the words below he has given me permission to share here. Once again, one last time, I watched my now grown son ollie and kick-flip, while I sat on the porch as I once did, only this time not with Tinne, the puppy you see in the top photo, but with Romeo. When we made eye contact across the grass, it was a powerful shared moment for both of us. Mike’s title for the photo and this blog post puts me in mind of a Joni Mitchell classic, “The Circle Game.” Those of you old enough, like me, to have followed her early career, will know it well. And in the days after Vatican II, in those glorious days of Pope John XXIII and beyond, it was a song we could and actually did sing in church. I’ll admit, I can’t get through listening to or trying to sing along without crying my tears, so if you take a listen, have your kleenex handy. I know the words by heart I’ve sung them so many times, lived them so many times. and promises of someday make up his dreams. (chorus):And the seasons, they go round and round. . .
cartwheels turn to carwheels through the town. before you drag your feet just to slow the circles down. (chorus): And the seasons, they go round and round. . .
though his dreams have lost a lot of grandeur coming true. (chorus): And the seasons, they go round and round. .
And so it is with looking behind from where I came. Though we both know and feel my move is the right thing, there were tears from both Mike and I on that sidewalk, on the front porch, as we said good-bye to the home where we had lived together, where he had grown up. The final one among many good-byes on that porch, that driveway: waving to friends driving off, waving good-bye to Mike when he first drove off to Portland, waving good-bye to my parents the last time I saw them alive together. Wiping my eyes as my friend Lynne drove away with my golden retriever’s body to the crematorium at the vet school, not knowing how in the world my legs would carry me back up the steps. When I was in escrow to buy the blue house, I was ignorant about what the consequences of buying a house in a motor-business zone might become; I suppose everyone was. In those days, there was no obstacle to receiving a residential loan from the bank, even an FHA loan. Once or twice I even flippantly joked about it meaning I could sell to McDonald’s for a million dollars some day. I’m not proud of that, how I said such things just to make a joke, not being able to know or care what it would really mean to make that house a home. That is what I had yet to learn. I became more respectful of that almost immediately upon moving in, when I was visited by the two men who owned property next door and across the street at the time. Each told me in their own imperious manner that they had expected to be able to purchase it, and what their plans for it had been, as if my son and I were somehow interlopers in a predestined scheme.Then I remembered how the young woman who lived there said that her parents, who owned the house, were really glad “that a family got it.” I also remembered I had had a psychic reading several months before I even lived on Asbury Street in which I was told “the house will be given to you.” I had no idea which house “the house” was, so I had assumed it was the one I had chosen to rent soon after across the street from the blue one, the yellow one I’ve written about here before (only when I moved in, it wasn’t yet yellow). 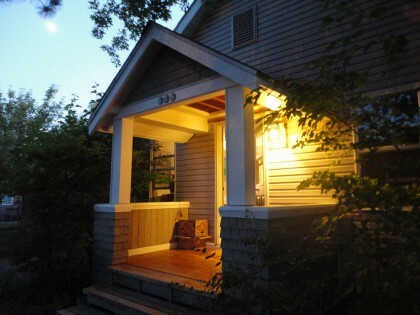 But the not-yet-yellow house was merely a stepping stone. I had to be there to see the blue house come up for sale so it could be “given to me,” amidst others grabbing for it to advance their own investment or business agendas, something I was blissfully unaware of until informed of it by both my new so-called neighbors. I still had no idea what that neighborhood and that house would become to me, and how I would stand up for it, fight for it even, over and over. How I’d mourn the huge elms on the corner lot that fell to disease, curse the new neon at the Subway across the parking lot that dimmed my view of the stars (and fantasize about shooting them dark with the beebee gun I’ve never owned), grieve the blackberry brambles along the old grain towers where I and many other neighbors picked before the whole site was bought out by a corporate agribusiness entity who tore them out to “modernize.” Since then, even the new construction has been abandoned along with the original towers to an owner tearing them down at a snail’s pace, recycling everything he can to make a buck before building more apartments. Or how the designation of the Legacy Crossing Urban Renewal District that came on the heels of both grain tower sites standing empty would be my initiation into the politics of urban land use. Since the blue house pretty much sits equidistant from both historic grain tower sites, I was pretty much smack dab in the middle of it whether I wanted to be or not. When I first got sick and couldn’t teach anymore, I thought to myself as I watched students and faculty walk by my front windows on crisp fall days that if I had to stay home, even though I couldn’t help people in the classroom or my office on campus anymore, I would help them if they came to my door. And over the years many people did just that, whether they were simply wondering if they were on the right street, wondering if I knew who might have lost a wallet out in front of my house, or coming to consult with me about their astrological charts or their broken hearts. I never dreamed when I made that commitment to help those who came to my door that I would someday be standing up for the quality of life in the neighborhood itself, culminating in standing up for the future of my very own house. But life is funny that way. That’s what I said in my public comments to the Zoning and Planning Commission and the Moscow City Council. There have been times when I was so frustrated and disappointed with the way things seemed to be going in the powerful politics of the Legacy Crossing Urban Renewal District that I’d rant to myself when I died I’d give my house and the land it stands on back to the Nez Perce tribe, since we white folks stole it all from them to begin with anyway, and wouldn’t that throw a fly in the community development ointment. But even that fiery private notion was quelled on an evening last year when I heard the Native American Drumming Circle from the University of Idaho open an art show with the theme of embracing the enemy. They sat in a circle, in the circular tower at the Latah County Grain Grower’s site, (which thankfully will be preserved intact as performance space, shops, even living spaces some day), first in silence, then to drum and sing. Some of the performers were from the Nez Perce Tribe, or Nimi’ipiuu, as they call themselves. Their beautiful songs, strange to our modern ears, reverberated in the empty steel tower like arias in an opera house, or Gregorian chant in a church. It felt as if they were healing the emptiness of greed and slaughter by remembering the land and our true connection to it and one another, which we all share, whether we realize it or not. I cried silent tears of renewal and gratitude and awe. The drumbeats and voices resounded in my own rib cage and heart. I, too, was filled with beautiful music, like the seemingly empty circular building. Perhaps that experience helped me find the courage to make sure the blue house gets to stay a house, a charming old residential bookend of South Asbury Street, and that whoever owns it can fix it up or rebuild it if it does succumb to fire or flood or whatever else might befall it in the next decades. When I first walked into it 20 years ago I was tired, getting sicker by the day, without knowing that’s what was happening. I said to myself, “This will do.” The hapless brown carpet assured me we could get the dog Mike wanted, that the boys could get it dirty from play and it wouldn’t show every little spot. Not quite realizing this would mean I could no longer apply for teaching jobs all over the country, and or that within a year I would be too sick to teach at all, I simply thought to myself, “I can move one more time if it’s just across the street.” I had no idea the blue house was going to teach me how to put down roots, both in the garden, in my relationship with my son, and in my soul. To live honoring the circular magic of the seasons. And show me what it means to be a responsible citizen in a community of neighbors. 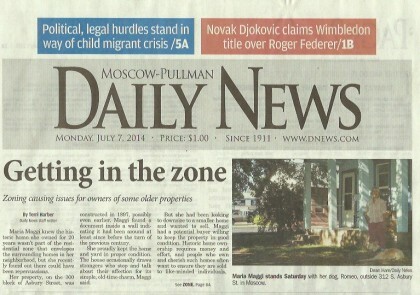 Part of the interest the paper has in this story is whether or not the city will refund my rezoning application fee. I guess it would be nice, but it isn’t something I’d seek for myself. It was money well spent, the only available option to procure a fitting going away present to the house and the neighborhood that has taught me so much. Refund or not, what I’ve learned is priceless, and the rezoning fee a pittance in comparison. I think the sentiment expressed in “The Circle Game” about not being able to return is true in a personal sense. But I also find now that I’ve given my house its future as a house in the neighborhood I can return to it in that broader sense, and share in how it will live on in that larger way. That’s the true circle–when something that was mine earns its rightful place in a design larger than just me and my own wants and needs at the moment. The 360 degrees I’ve traveled to learn this is worth every step of the way “back” to what’s really important. Meanwhile, at my new house, I settle in. I illustrate my grocery list on the door size chalk board left to me in the kitchen, and I sit in the garden of my front yard, admiring the moon over the trees and the buttery warmth of the handmade porch light. My feet are bare, and Romeo sleeps next to them. The air has cooled down for the night. 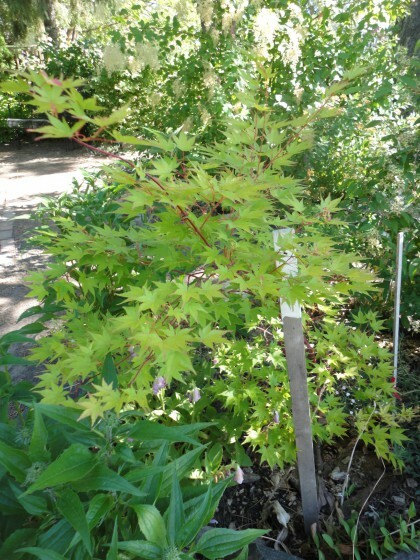 I’ve watered the little Korean Maple that was planted here in honor of the baby born last October to the young couple who passed on this house to me and made it such a beautiful place to live. This past morning, the friend who lived in my new house 40 years ago (when she was a newlywed) came to visit. The moon gets more round each evening. Yes, indeed; time is a circle. I finished revising the part of this post above my signature before my nap time, but decided to wait until evening to post it. During my nap, the phone rang, but I let it go to voice mail. After I had rested long enough, I checked to see who had called. It was a local number I was unfamiliar with: someone from the Moscow Historic Preservation Commission calling to tell me they were giving me an Orchid Award for my efforts to rezone the blue house on Asbury Street. Could I come to the Ice Cream Social at the McConnell Mansion on July 27 to receive it in person? Talk about Miss America shock. I laughed and cried, like Mike did at his own wedding. 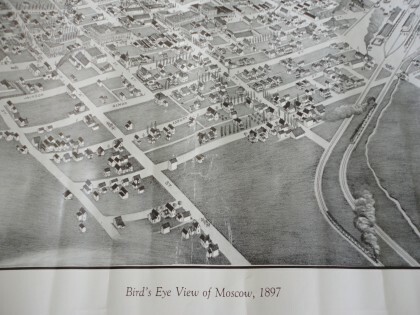 When I made my presentation to them last Spring, I talked about how Almon Asbury Lieuallen, one of the city founders, had had to sell a large portion of his land off in the late 1890’s due to a bank failure. He subdivided 3 streets; two named after himself–Almon and Asbury–and one named after his daughter, Lily–into long narrow lots. My house, the blue house, was an intact example of a house that had been built in one of the first subdivisions in Moscow. It was not fancy like the houses up the hill in Fort Russell, but still, it was a piece of the town’s history. The commission members thanked me for caring, which at the time I found lovely, but also odd–it was so second nature to me by then to care about what happened to it that securing its future was simply part and parcel of the only way I could be able to leave it in good conscience. I was happy they agreed to write me a letter of support for when I appeared before the Zoning and Planning Commission and then the City Council with my request, but it never occurred to me I’d get an award for doing what I was doing. I was so taken with its presence on this map that when I did the cover art for my first book of poems in 1996, I xeroxed the piece of this black and white replica with my house on it to include in the collage I made that the publisher decided to wrap around the front and back of my book. And so it is that the blue house on Asbury Street will live on, not only in art, but in actual time–time that bends back and reaches forward, encircling us all in its mysterious and generous arms. What a wonderful story. Thank you so much for sharing. Blessings in your new home. Thannnk you dear Maria, for sharing this incredibly rich, oh so precious, real life story with your followers! Amazing… I know of no other than can even come close to this! May beautiful memories and life experiences fill your heart and new home,- always! Thanks for feeling it all with me as you read, Leslie–yes, it really feels good to be able to make a difference! Geez, Maria. You had me tearing up just at the picture! The rest just got better from there. Good thing I have tissues on my desk! Welcome to your new home, and such a beautiful farewell to the one that’s cared for you as well as you’ve cared for it. Thanks for crying along with Me, Kristin!! I really appreciate your heartfelt response so much! Such a beautiful story of hope and rebirth, Maria. I love the tone, the words, the pictures… Human to the core, uplifting. Thank you. Beautiful words, Maria, and lovely pictures! I’ve never heard the Circle Game song; it is quite moving. 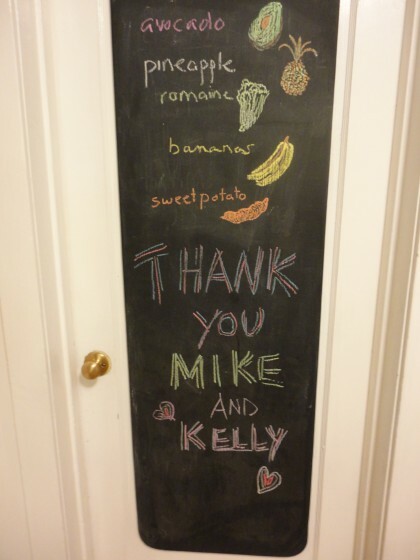 I’m glad things are going well with both the old and the new house, and your efforts being fruitful and recognized. Thanks for sharing! Thank you so much, Maria, for sharing with us your beautiful memories in such elegant prose. The ‘little blue house’ was indeed lucky to have you, Mike and your dogs there for 20 years, as was the neighborhood. I hope you will be very happy in your new abode. I hadn’t thought of the Joni Mitchell song for decades, but the lyrics brought a lump to my throat. You’re welcome Jaye–I’ve had some computer issues and been away from the internet for a few days–so nice to come back to such heartfelt appreciation!! I am glad to remind you of that Joni Mitchell classic too. Thanks for your wonderful comment.